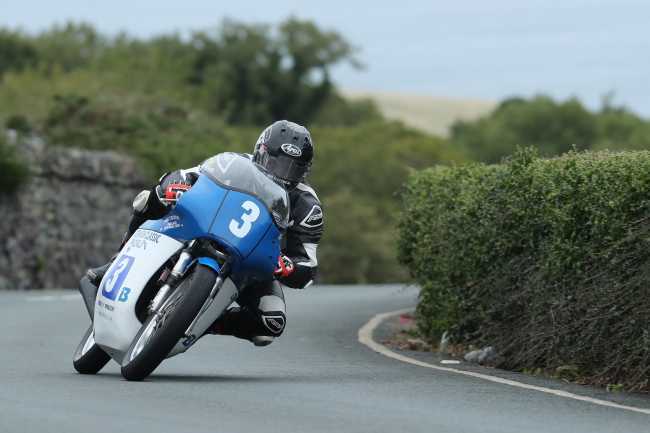 Dom ‘the bomb’ Herbertson clinched his first Mountain Course win with victory in today’s Locate.im Junior Classic TT Race at the 2018 Isle of Man Classic TT Races presented by Bennetts. After the race the Newcastle based rider, riding the Davies Motorsport Honda, revealed what the race win meant to him. After a disrupted qualifying week, it was difficult to assess form and machinery in the Junior class but Jamie Coward, on the Ted Woof/ Craven Honda topped the qualifying board from Herbertson – the pair were the only ones to post 100mph+ laps. Ripley Land Racing Honda rider Michael Rutter and Herbertson’s teammate Alan Oversby were the third and fourth fastest qualifiers with a single qualifying lap each. With the race cut to three laps from four due to the earlier delay, the single cylinder 350cc machines were all expected to complete the race without the need to refuel and a straight ‘gun to tape’ battle was anticipated. After frustrating delays, schedule changes and eventually confirmation that the race would be over three rather than four laps, the Locate.im Junior Classic TT Race, the third Race of the 2018 Isle of Man Classic TT Races presented by Bennetts finally got underway just after 4pm. Michael Rutter, who won the corresponding race in 2017, established an early lead, half a second in front of Jamie Coward, who finished third in 2017, at the first timing point at Glen Helen. The leading pair had a lead of over three seconds from Dom Herbertson in third with Hefyn Owen and Oversby completing the top five. As expected the race was dominated by Hondas with Chris Swallow’s PKP/ Bladon Enterprises Hall Green Velocette the first non-Honda in eleventh place. At the front of the field Rutter had extended his lead at the front of the field to over four seconds from Coward by Ramsey while Lee Johnston, who finished runner up to Rutter on a Black Eagle Racing MV Agusta in 2017, moved into the top five ahead of his teammate Oversby. Rutter and Coward crossed the line almost simultaneously at the end of the first lap, treating grandstand fans to a spectacular sight, with Coward (101.658) marginally in front of Rutter on the road but Rutter (102.416) almost ten seconds ahead of Coward on corrected time. Dom Herbertson (101.678) took over two seconds out of Coward on the last mile from Cronk Ny Mona to the Grandstand to move into second place. 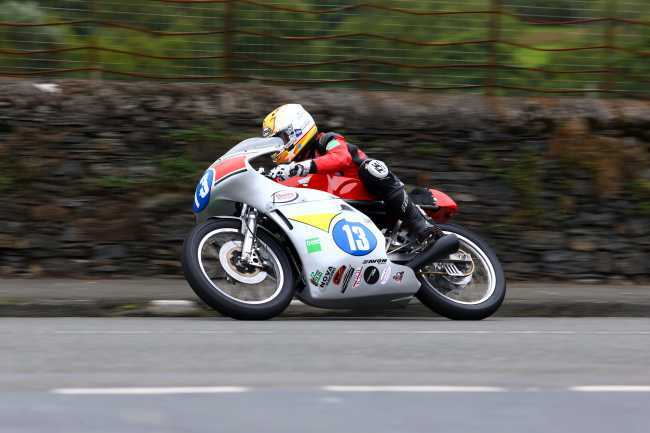 The leading three had already established a healthy lead of over thirty seconds from Davies Motorsport teammates Oversby and Johnston with Hefyn Owen reported to have stopped on the Mountain mile. On the second lap the gap between the top three and the rest of the field grew to over forty-five seconds by Glen Helen while behind them Oversby and Johnston were indulging in their own battle – Overby ahead at the Grandstand, Johnston back in front by Glen Helen, Oversby in front again at Ballaugh. Meanwhile Rutter moved ahead of Coward on the road by the Bunaglow to give himself a clear road which he needed as Herbertson was cutting in to his lead – the gap was down to 1.7 seconds by Ramsey. With all eyes on the clock at the end of the second lap, there was drama as Michael Rutter was reported to have a punctured rear tyre at Governors which left Herbertson, with a second lap of 104.082, almost fifteen seconds in front of new second placed man Coward (102.968). Oversby (100.197) was leading the Davies Motorsport battle for the final podium place by almost four seconds from Lee Johnston (99.965) at the end of the second lap. Dan Cooper (99.981), carrying the number 1 plate on the CSC Racing Honda, moved into the top five following Rutter’s retirement. Herbertson clinched his maiden Mountain Course race win with a final lap of 103.640 from Coward (103.984) but behind the leading pair Johnston had moved into third at Ramsey, less than a second ahead of Oversby. The Northern Ireland rider secured the final podium place with a last lap of 101.119 to Oversby’s 99.623, with Cooper completing the top five. Jeff Ward, who finished 21st, received the Phil Read trophy for the highest placed 250cc machine in the race. 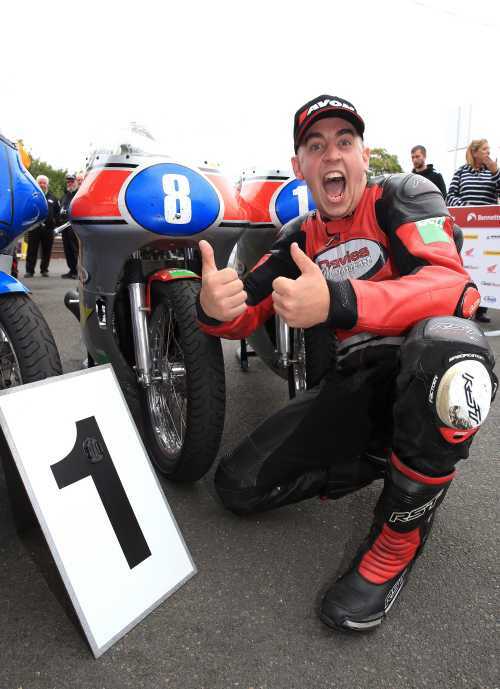 Dominic Herbertson, winner of the Locate.im Junior Classic TT Race. during the Locate.im Junior Classic TT Race.